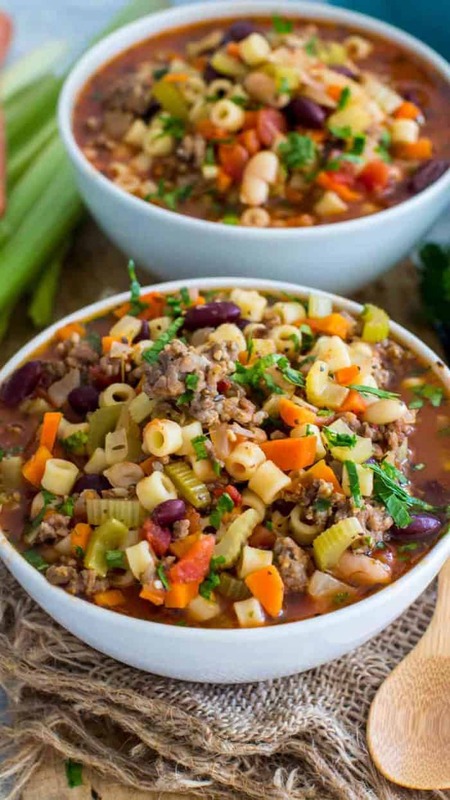 Pasta Fagioli Soup recipe is a classic Italian soup. 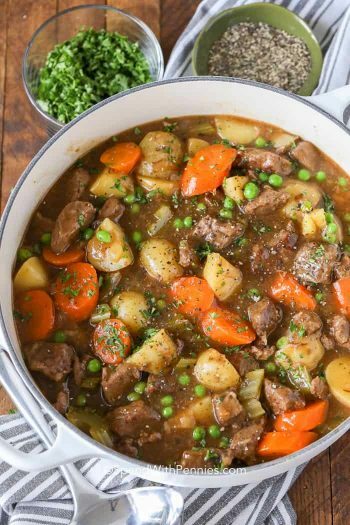 It’s deliciously hearty and comforting and takes less than one hour to make! I love a good and hearty soup year around, as there is nothing more comforting and soul warming. 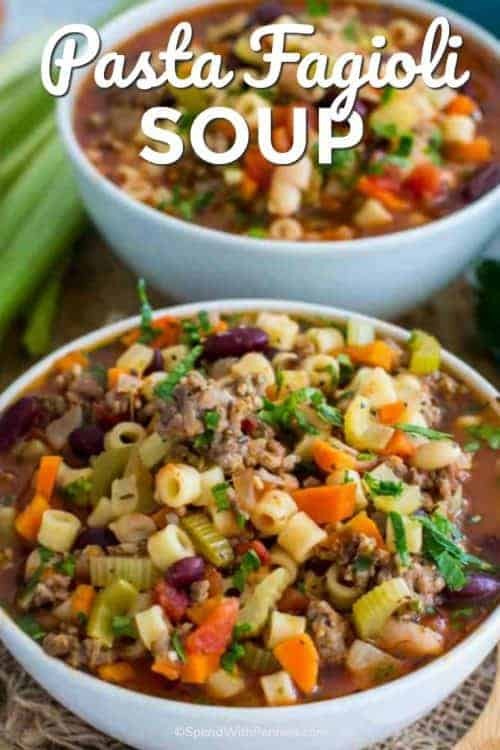 This Pasta e Fagioli Soup recipe is one of my favorites. Lots of veggies and spicy sausage meat cooked in a hearty and rich tomato broth. Pasta Fagioli is one of my favorite soups served at the Olive Garden restaurant. 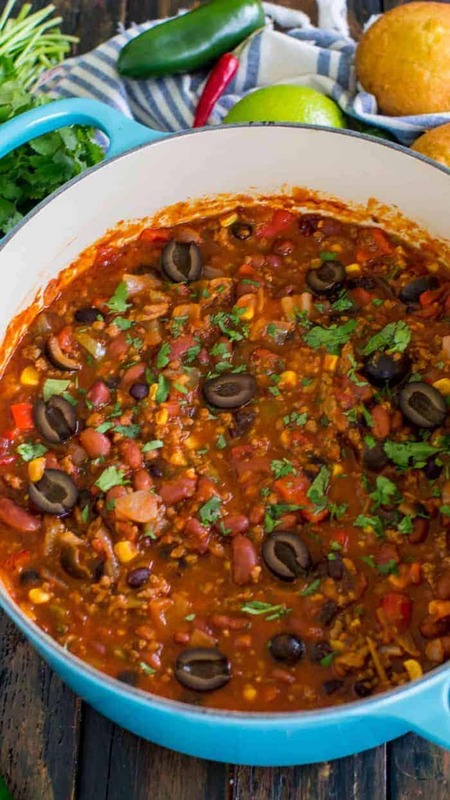 In this easy homemade version, two types of beans have been added for extra protein and creaminess. 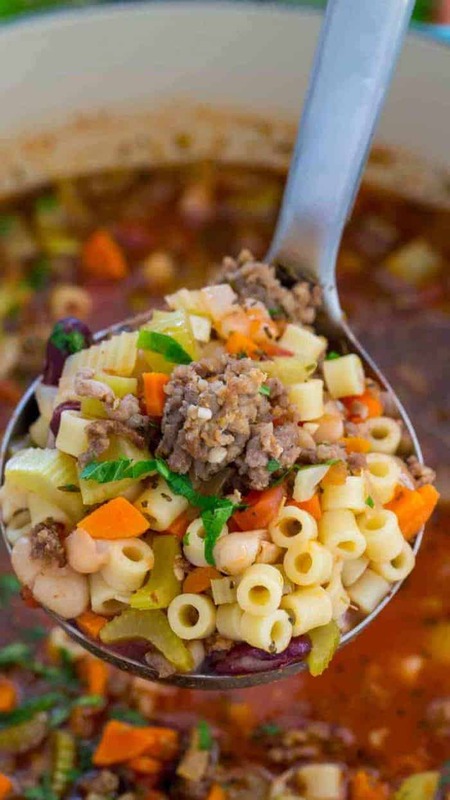 Lots of dried herbs make the broth for this easy Pasta Fagioli recipe irresistibly flavorful. You can enjoy this Pasta e Fagioli Olive Garden staple anytime you crave it. 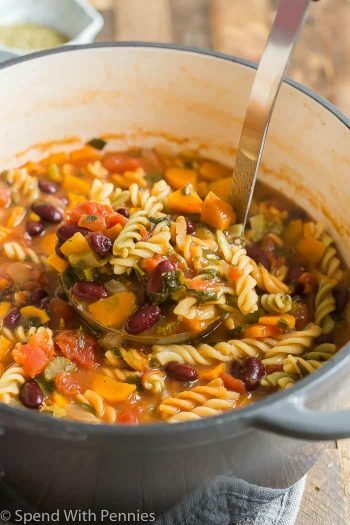 You can make a vegetarian Pasta Fagioli soup recipe by skipping the sausage, and you can also use whole wheat pasta for an extra nutritious kick. What is pasta e fagioli? What does pasta e fagioli mean? 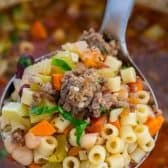 Pasta e Fagioli means “pasta and beans.” A traditional Italian pasta fagioli recipe is a classic dish, made with easy to find, affordable ingredients. How do you say Pasta e Fagioli? The Pasta e Fagioli pronunciation seems tricky, and after a few tries, we had it down. We listened to it over and over! Once you’re an expert, you can practice saying Margherita Pizza in your best Italian accent! 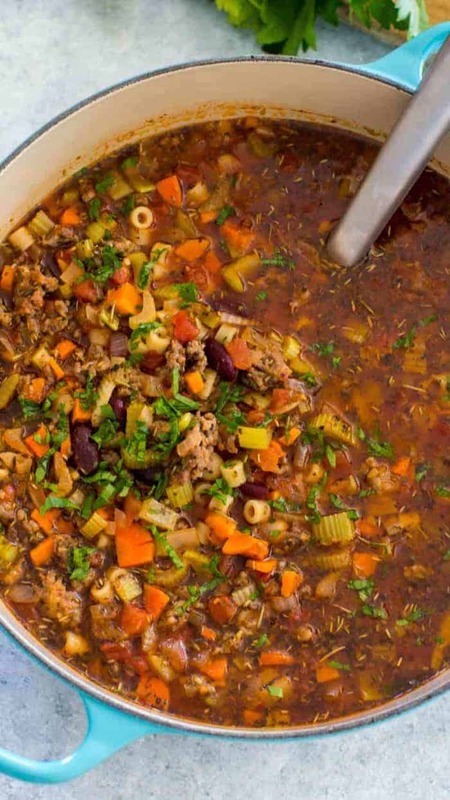 What is the difference between Minestrone soup and Pasta e Fagioli soup? 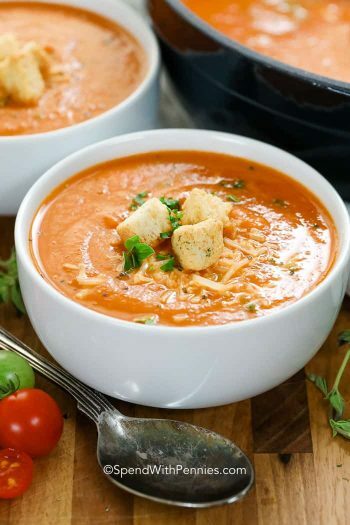 The main difference is that minestrone has lots of different vegetables in it, while a pasta fagioli recipe usually is made with just pasta, beans, in a tomato broth, adding just a few veggies like celery, onion, garlic and carrots for extra flavor and texture. What kind of pasta is used in Pasta e Fagioli Soup? Traditionally tiny pasta is used like ditalini, pipettes, elbows, mini farfalle, even mini shells. Can you make Pasta e Fagioli Soup in the slow cooker? Yes, you can user your slow cooker for fagioli pasta! Cook sausage until browned and no longer pink in a large skillet. Add cooked sausage meat to a slow cooker along with the rest of the ingredients, except for the beans and pasta. 30 minutes before the time is up, stir in beans and uncooked pasta. 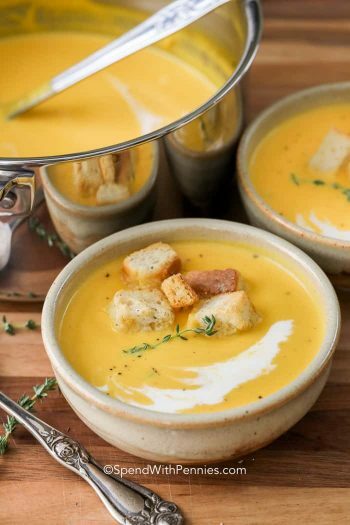 If you intend to freeze this soup, make sure the veggies are still crunchy, otherwise they will retain their crunchiness after defrosting/reheating the soup. Cool soup completely before packaging it for freezing. Add soup to a gallon or quart-size zip-top plastic freezer bags. Lay bags flat in a single layer in the freezer, when frozen, stack bags to save space. 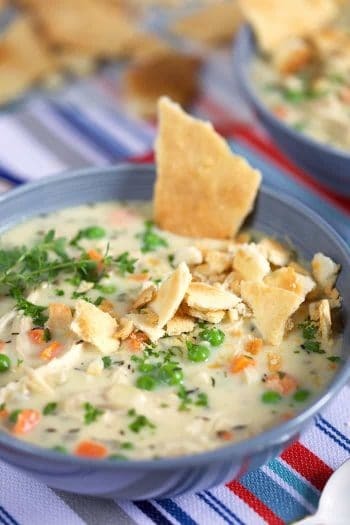 How do you heat frozen soup? Set the frozen soup bag or container in a sink with hot water , wait for the soup to begin defrosting, break it into pieces. Add the soup pieces to a soup pot and heat over medium-low heat. If need add more water to the soup, 1 cup at a time, stir frequently. Add the soup pieces to a microwave safe bowl. Cover the bowl with wax paper or plastic wrap. Poke a few holes into the covering, to act as steam vents if you use plastic wrap. Microwave the soup on low first for the ice crystals to melt. Stop and stir and heat again until it is hot. Stopping to stir from time to time. 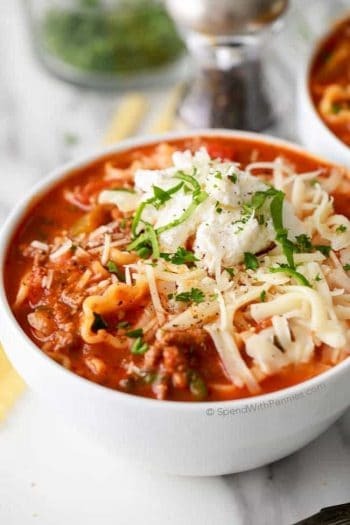 Pasta Fagioli Soup, also known as Pasta e Fagioli Soup, recipe is a classic Italian soup served at the Olive Garden restaurant. Hearty, comforting and delicious, ready in less than one hour. Place a large soup pot or Dutch oven over medium heat and add olive olive oil. Once the oil is hot, add ground Italian sausage and cook without moving for about one minute. Crumble it using a wooden spoon and continue cooking until browned, about 3-5 minutes. If needed, drain excess fat. Push cooked sausage to one side of the pot, so it covers only half of the bottom of the pot or Dutch oven. Add onion and garlic to the other half and cook for 1-2 minutes, stirring occasionally, until the onion is tender. Stir to combine the browned sausage with the onion and garlic. Add chopped carrots, celery, diced tomatoes and tomato paste. Stir and cook until tender, for about 4-5 minutes, stirring occasionally. Add dried basil, dried Italian seasoning, dried thyme, dried rosemary and red pepper flakes. Stir to combine. Add tomato sauce, chicken broth and drained and rinsed beans. Season with salt and pepper, to taste. Bring to a boil, reduce heat to low and simmer, covered for about 10-15 minutes or until vegetables are tender. If needed, add more water, one cup at a time. In the meantime, add water a large pot over medium-high heat, season with salt. Bring to a boil and cook pasta according to package instructions. Drain well, toss with a bit of olive oil and set aside. Once vegetables are tender, stir in pasta until heated through. Garnish with parsley if desired, and serve immediately.